You may have a piece of artwork you want to add to a photo. The artwork can be of any file type you find for the supported formats that you can open in Elements. Quite often, you may find a vector art drawing or a PDF file that contains the artwork you want to import; however, you can use any of the supported formats for placing content on a photo. Note that when you place an image, no matter what file format, it’s inserted into your open file as a Smart Object. Smart Objects are essentially composed of two files, one inside the other, enabling the image’s source data, whether pixel or vector based, to be embedded. Adobe uses the analogy of a new file, the child, which is embedded into the original file, the parent. What does this all mean to you? It means that you can repeatedly transform (size, skew, rotate) your image without losing any additional image quality because Elements uses your original source date to render the transformation. One caveat: With vector images, you can size up and down repeatedly and never worry about losing quality. With raster images, however, you can safely resize repeatedly, but you don’t want to size larger than your original dimensions or else you risk resampling or degradation. Open a photo in the Photo Editor. 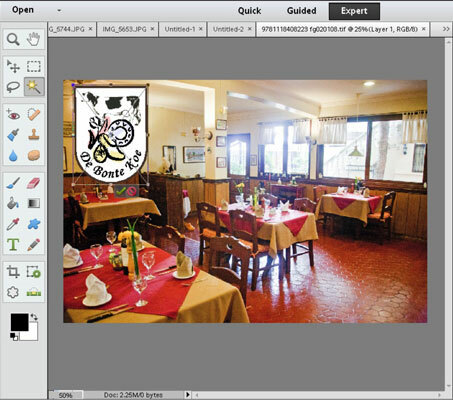 You must start with a file open in the Photo Editor in order to use the Place command. The Place dialog box opens. This dialog box has the same options you find in the Open dialog box. Select a file to place. Your file can be an image format, EPS, Adobe Illustrator .AI or other type of vector format, or PDF or any other file type you see listed in the Files of Type drop-down list (Windows) or Format pop-up menu (Mac). Click the file you want to place. When you place an image, you see handles around the image that can be used for sizing the image. Smart Objects always import into your file with an X over the image, which distinguishes them from regular images. Size and position the image. If you import a vector art image or PDF file containing vector art, you can drag the corner handles out to size up the image without losing image quality. Press the Shift key when sizing the image to constrain proportions and press the Enter (Return) key to accept your resizing edits. Click the image and move it to the desired position. Press Return and commit your layer. The small black-and-white Smart Objects icon is in the bottom-right corner of your layer thumbnail in the Layers panel. If you open a Camera Raw 16-bit image, you cannot place artwork on the photo. You must first convert the 16-bit image to an 8-bit image by choosing Image→Mode→8 Bits/Channel.